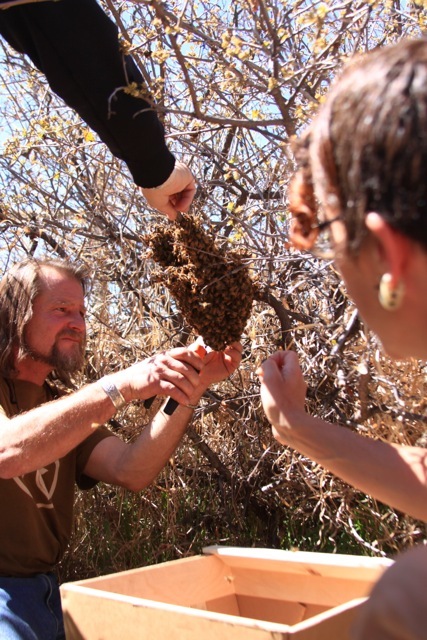 Honeybees unexpectedly swarm from a Back Yard Hive at the start of a Bee Guardian workshop in Paonia in late April. Bee Class starts at 10:00 on Saturday morning. At 10:01, Caren announces that her hive is swarming again. We have gathered at this farm in Paonia from as far away as Salt Lake City to learn how to be bee guardians. A swarm is a bonus none of us could have anticipated. 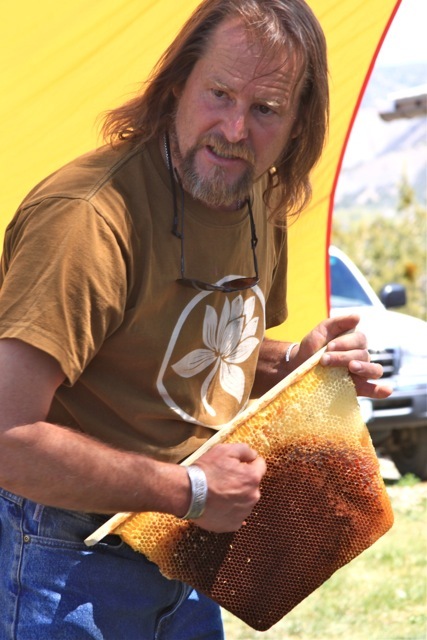 Bee guardian and farm owner Caren Vongontard has hosted this workshop, offered by the Soil Academy in Paonia, for the past three springs, with bee charmer Corwin Bell and his team from Back Yard Hive in Boulder. The night before class, Bell gave an introduction to his pioneering philosophy of bee guardianship. “A bee colony’s immune system is its ability to react and adapt to its bioregion, and to pass that knowing on,” he says, his gestures as graceful and expressive as a bee’s dance. 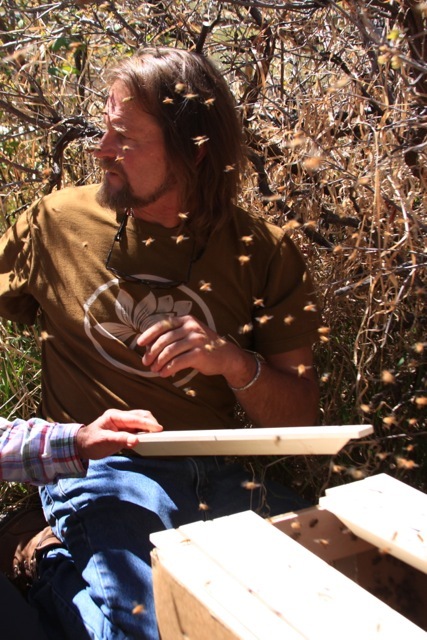 Bell began collecting “feral” bee swarms on the Front Range fifteen years ago, and housing them in top bar hives of his own design. 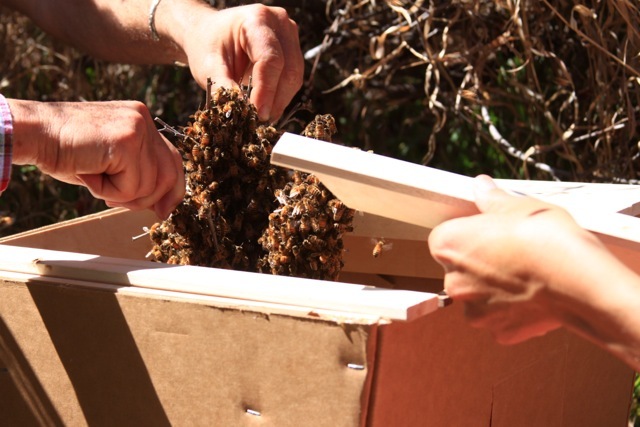 Through workshops, and selling both architectural-quality plans and hives, Bell has fostered honeybee colonies up and down the Front Range, in the North Fork, and in other communities across the state and around the world. 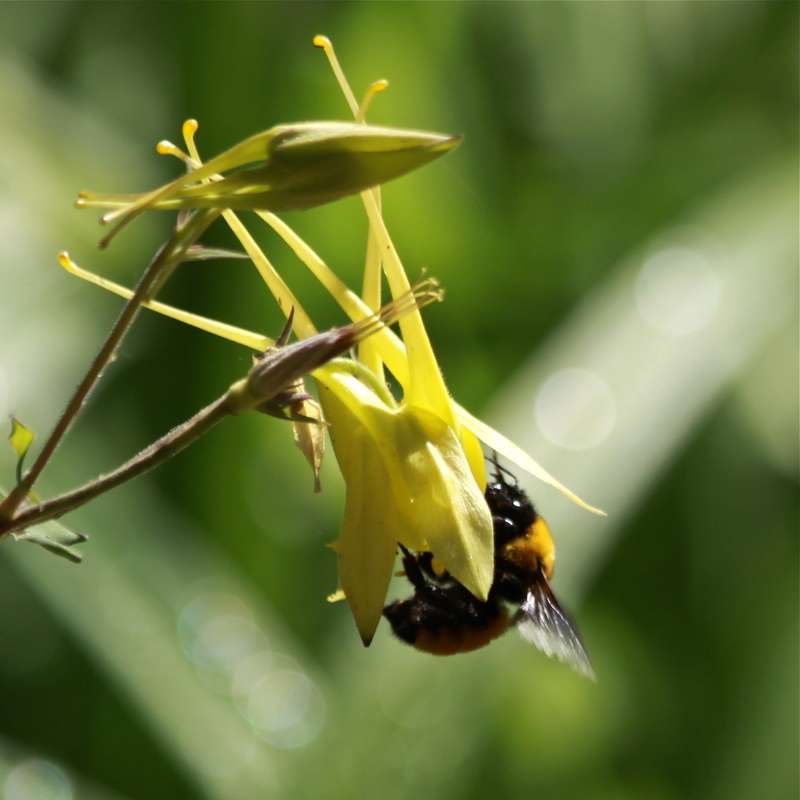 Bell points out that honeybees in their capacity as pollinators are critically important to the survival of the human species, and he believes that we can help them survive and thrive by offering them safe haven in our own back yards. It’s easy to think of an aspen grove as a superorganism, because underground all the trunks are connected through the root system. 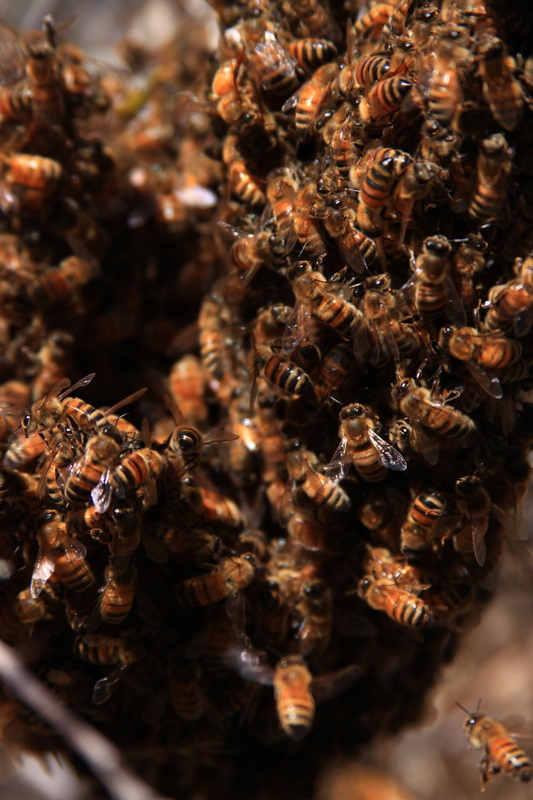 Bell describes the superorganism of bees as something larger even than a single hive. Not only are the honeybees of a given hive connected by something intangible, but by periodically throwing off swarms, and moving to a new hive when they become honey-locked, bees of an entire region are linked by common knowledge and genetics in a single superorganism. By the end of the evening’s presentation I am completely enchanted with both honeybees and Corwin Bell. Looking for the right place to hang out. And so at 10:01 the next morning, our class of more than twenty troops up to the strawberry patch where Caren has two of her several hives in a juniper-post shade shelter. We watch enthralled as bees pour out of the narrow horizontal doorway at the bottom of one hive, filling the air, seeking the right place to cluster. “Maybe they’ll go here,” Caren says of a forsythia, then a few minutes later, “or maybe in this blue spruce.” A few minutes longer and the bees settle on two twigs of a chokecherry just ten feet from the hive, and a couple of feet off the ground. By 10:30 we are watching two clusters of calm bees, two feet apart in the same shrub, and wondering which to catch first. A honeybee swarm is a wonder of nature. When a hive has more than enough bees, and a new queen has matured inside, the old queen leads most of the bees out to seek a new cavity in which to reproduce and live for a few more years. A hive can also swarm when it has filled its space to capacity with last year’s honey, or become honey-locked, and the bees leave en masse to start a new hive. By swarming, the bee superorganism extends tendrils out into its environment, increasing both its population and the successful pollination of uncountable species of plants over a wide area. In an agricultural setting this is an extraordinarily valuable effect for humans. 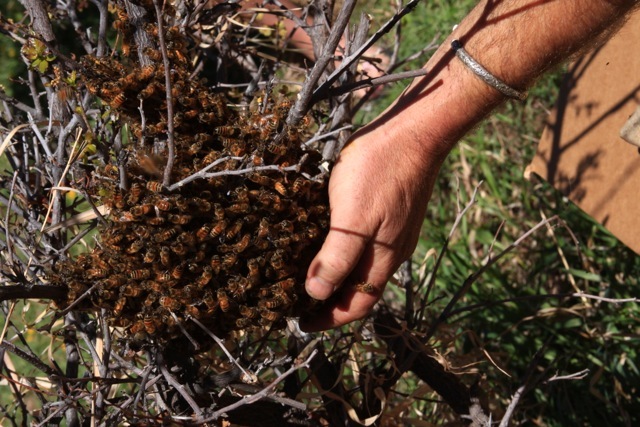 Bee guardians aim to provide a safe haven in a world increasingly hostile to honeybees. 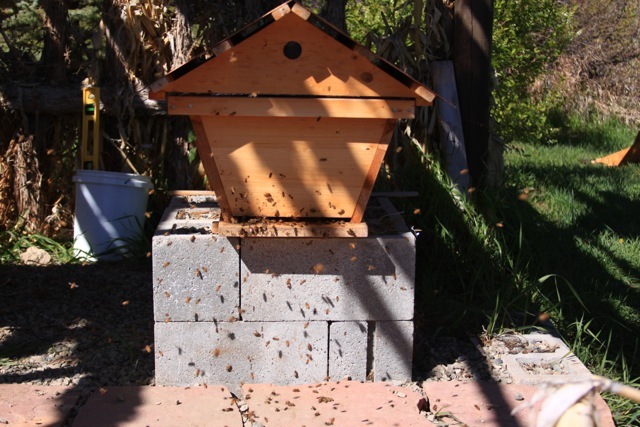 The top bar style of backyard hive requires little maintenance from the bee guardian, and with minimal interference the bee colony is enabled to thrive as it has adapted over around 25 million years to do, in balance with its surroundings. As with so many human endeavors that profit from the mass production of animal species, the bees, the environment, and ultimately human beings suffer from over-commercialization of honeybees. A complex interplay of factors, including (but not limited to) pesticides, mite infestation, and flattening of genetics, has critically imperiled the global honeybee superorganism. Full on collapse of honeybees worldwide would interrupt pollination of many plants that humans depend upon to survive. Think about that. 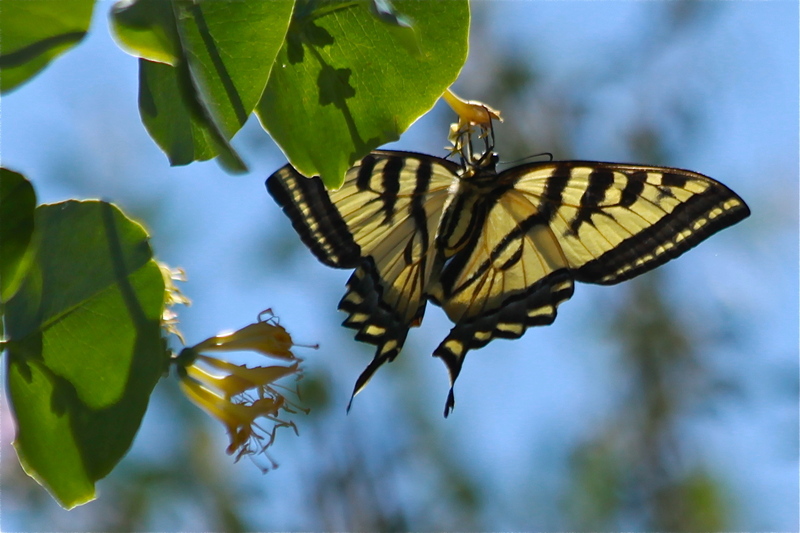 Virtually every plant we eat or use for feed or fiber requires pollination by some kind of insect, bird, or mammal. 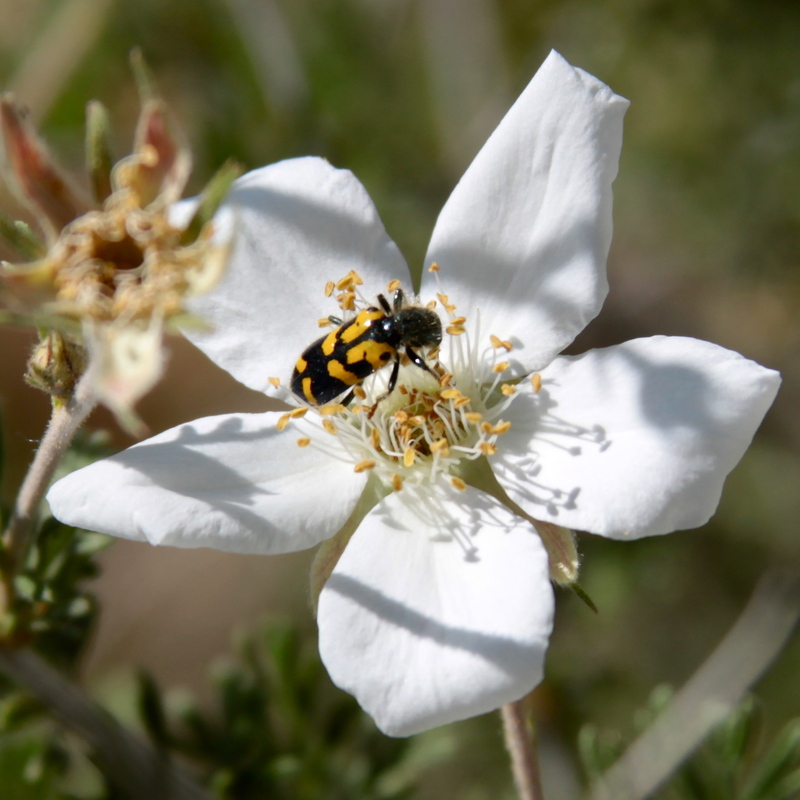 Bees of many species make up a huge percentage of pollinators. The bee guardian philosophy differs from commercial beekeeping in that its goal is to support bees in their wild, unfathomable complexity, and maybe gain a few jars of honey on the side, rather than to profit by their exploitation. It views honey as a valuable gift rather than as a commodity, and seeks to protect habitat and hive both for their own sake and as integral infrastructure in our human lives. To this end, Corwin Bell is single-handedly saving bees around the world with his compelling fusion of science and love. He has consulted on bee colonies from Scandinavia to Hawaii, and his patient observations and astute interpretations of bee behavior are breaking ground in the global effort to save the honeybee. His enthusiasm is as contagious as a revival preacher’s. At 10:30, we watch and assist as he clips twigs that extend from the smallest swarm on the shrub, then gently, gracefully, lowers the swarm into a prepared “fetcher” box, gives it a swift shake, and carefully closes in the barely disturbed cluster. As the bees settle down, he encourages us to cup our hands, one at a time, under the swarm that remains on the bush. The soft brush of bee hair and beating wings tickles my palm as I feel the heat generated in this docile, humming, living ball. Lowering the swarm into a special box called a fetcher for temporary housing. of bees surrounding their queen. 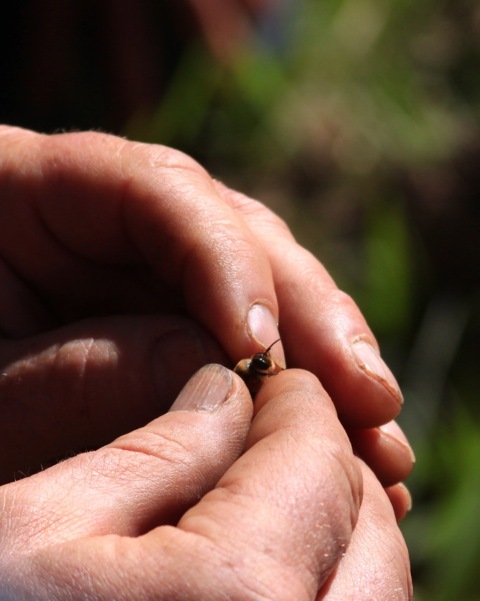 Corwin Bell gently holds a drone bee, showing the class the male bee’s enormous eyes. Bell says “There’s a drone!” and springs from a crouch to catch a single bee above his head. Holding it in a pinch just tight enough he shows it around for us to notice the enormous eyes of the rare male honeybee adapted purely to reproduce the bee colony and its collective knowledge. In a weird twist of fate, the first cluster swarms out of the fetcher and joins the buzzing ball on the limb. We mull over this phenomenon for awhile, until the bees have settled again. Then Bell and his rapt students repeat the process of snipping twigs and depositing the swarm in the box. This time, the swarm remains in its new temporary home. Two hours have passed with more than twenty humans mingling with clouds of honeybees. Only one of us has worn a bee screen, and nobody has been stung. swarm all the bees have settled into their new temporary quarters. of comb attached to a top bar from one of his hives. After lunch, we learn about the many ways bees use the comb they make inside their hives, and how and when we can help them by taking a share of their honey. The hands-on lessons continue through the weekend. By the time I leave Sunday afternoon I am exhausted and inspired. At home I will level a place under the birch tree to install my back yard hive, and wait patiently for my turn on the swarm list so that I, too, can become a bee guardian. 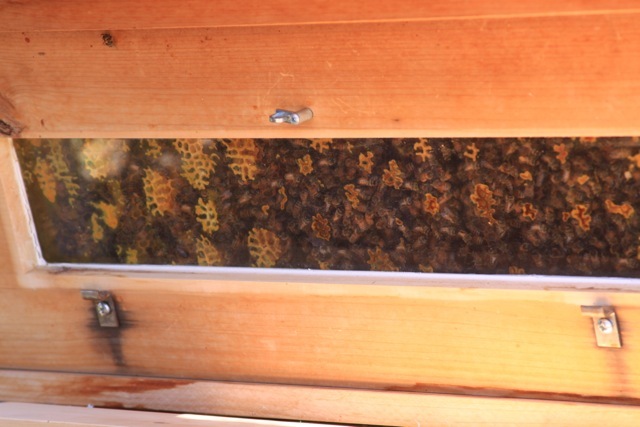 while honeycomb toward the back of the hive is stabilized by attachments clearly shown on the glass. For information on the Soil Academy’s agricultural classes and workshops, many of which focus on alternative or biodynamic approaches to farming, you can check out their website at www.soilacademy.com, or email Lynn Ruoff at info@soilacademy.com. On a whim, I got my name onto a second swarm list, and in a stroke of serendipitous synchronicity, the list manager called back ten minutes later. 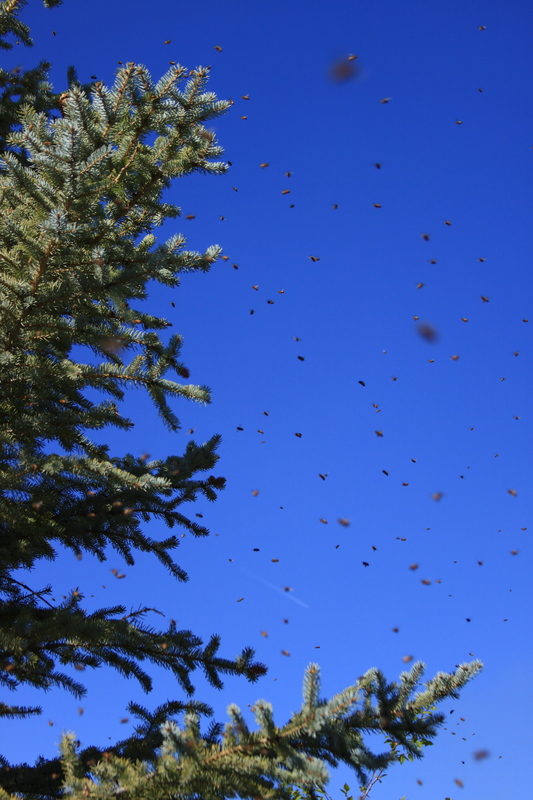 The swarm came from an ancient multi-trunked cottonwood along the Fire Mountain Canal, and was spotted and called in by some old friends I hadn’t seen in a long while. 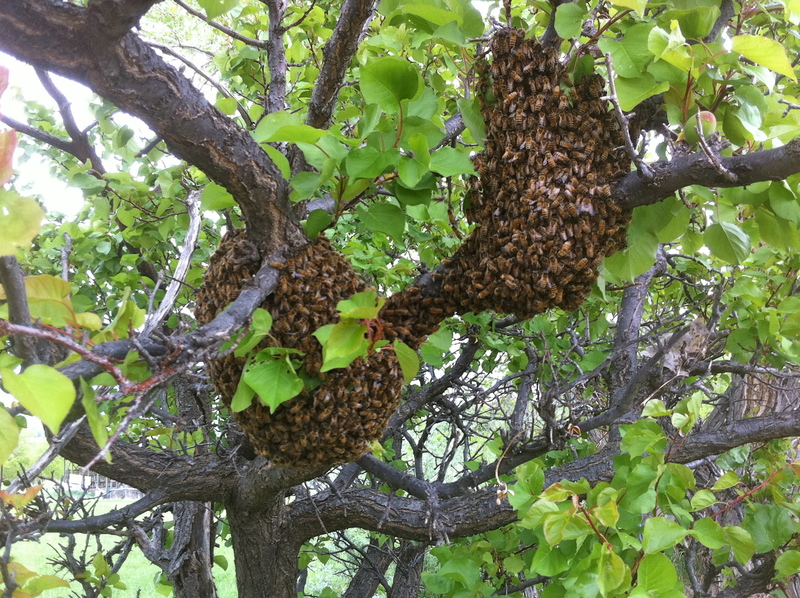 Two clusters of bees hung low on a fork of thick apricot limbs, with a bridge of moving bees about six inches long connecting them. Our first effort to extricate the bees from the apricot tree was unsuccessful, but I came back that evening with reinforcements, a neighbor who had already caught four swarms this season, and has been a bee guardian for three years. 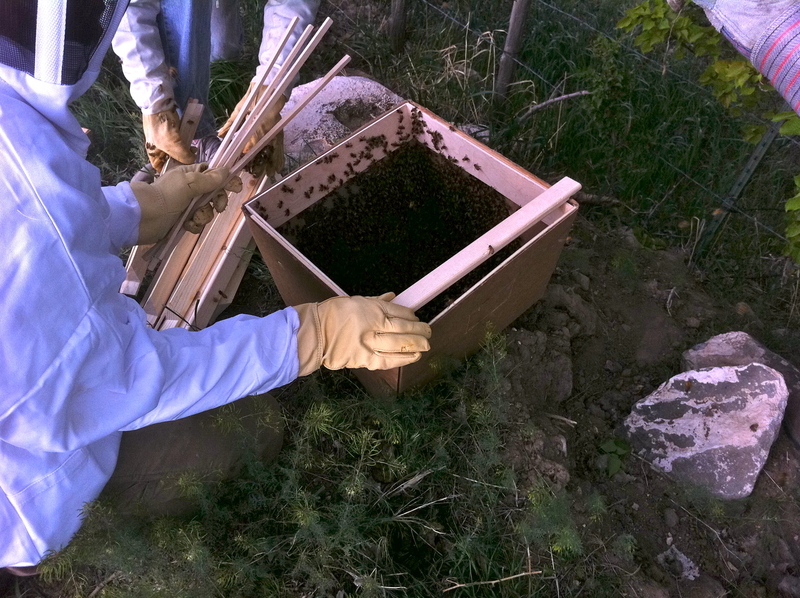 He brought a special box fitted with top bars that can transfer bees and all directly to the hive. Perhaps more importantly he brought his expertise. After we disrupted what may have been a double swarm with two queens earlier in the afternoon, all the bees had returned to the tree in one tidy ball, and so were easier to knock into the box. 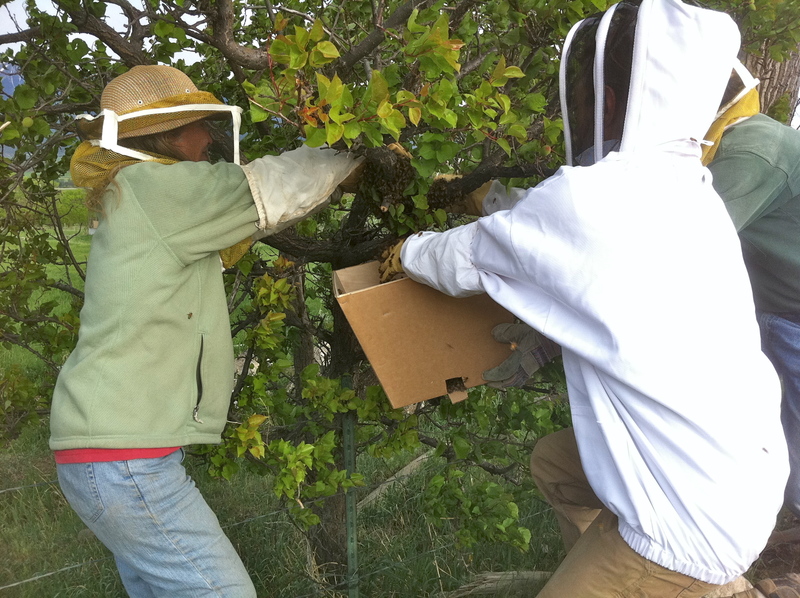 While Robin held this fetcher below the swarm, Joseph and I swept the bees into it from the branch with our gloved hands. A layer a couple of bees thick remained on the forked limbs of the apricot, and by this time it was so cold and windy that clumps of bees fell to the ground. I scooped them to the open door of the fetcher where they made their way in. Screened windows allowed us to leave the bees in situ until the next night. By doing this we hoped to allow the bees to behave normally the next day, leaving both the fetcher and the tree to forage, and all returning by nightfall to the fetcher where we presumed we had caught the queen. The top bars let the swarm begin to settle the queen right away into their new, albeit temporary home. When I returned to the canal at dusk the next night there wasn’t a bee outside the box. Peeking in one window I saw a quiet, tight ball of bees silhouetted in the southeast corner of the fetcher. Could they have already built comb? We had leveled the fetcher just in case. They had definitely moved in. I taped the door and windows shut, taped the lid on, and carried the precious cargo to the car. Left alone I would have set them on the seat next to me, but I had taken another neighbor with me who insisted I put them in the trunk. Arriving home in the dark, I set the fetcher on top of the hive, removed all the tape, and opened the door so in the morning they could begin to explore. At 6:30 the next morning, I popped out of bed but it was still too cold for any bees to emerge. At 7:15 I saw a single bee come out of the fetcher. I walked the dogs to the canyon through woods full of laughing yellow flowers and returned in half an hour. Bees were coming out in twos and threes, circling the fetcher, checking out the hive, and going back in. 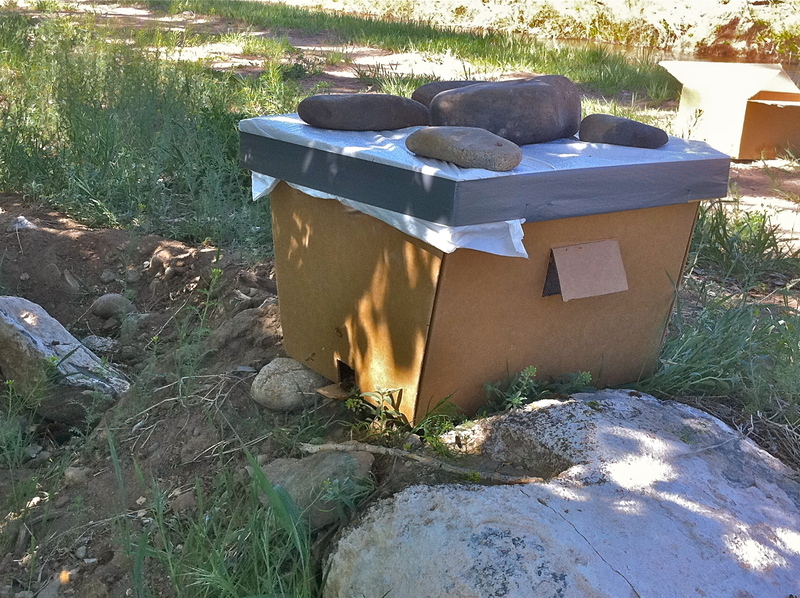 At the prescribed three days after hiving, I moved the false back from where it started midway (encouraging the bees to build brood comb in the front of the hive) to the true back. 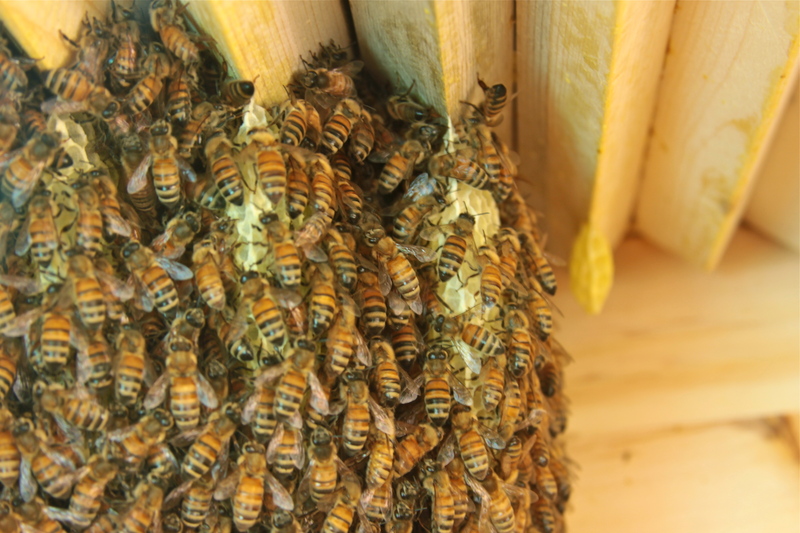 Now when they finish their brood comb and begin to build comb for storing honey and pollen, they’ll build towards the back, giving me easy access to leftover honey next spring. So after one intense week with a steep and delightful learning curve, I have relaxed into sitting with bees for the past three weeks. I’ve been watching bees leave the hive like shooting stars at random rapid intervals. I’ve watched as they come and go, come and go, one by one and five by ten, female worker bees all morning, interspersed with occasional drones in the afternoons. I have watched a poor drone dragged out the door by a worker bee, who rolled and dragged him around the corner before letting him go. He staggered, tumbled to the ground, flew up and went back in the hive, only to reemerge immediately. I’ve seen one bee carry a dead bee out the door and fly the carcass in a slow arc to the ground. 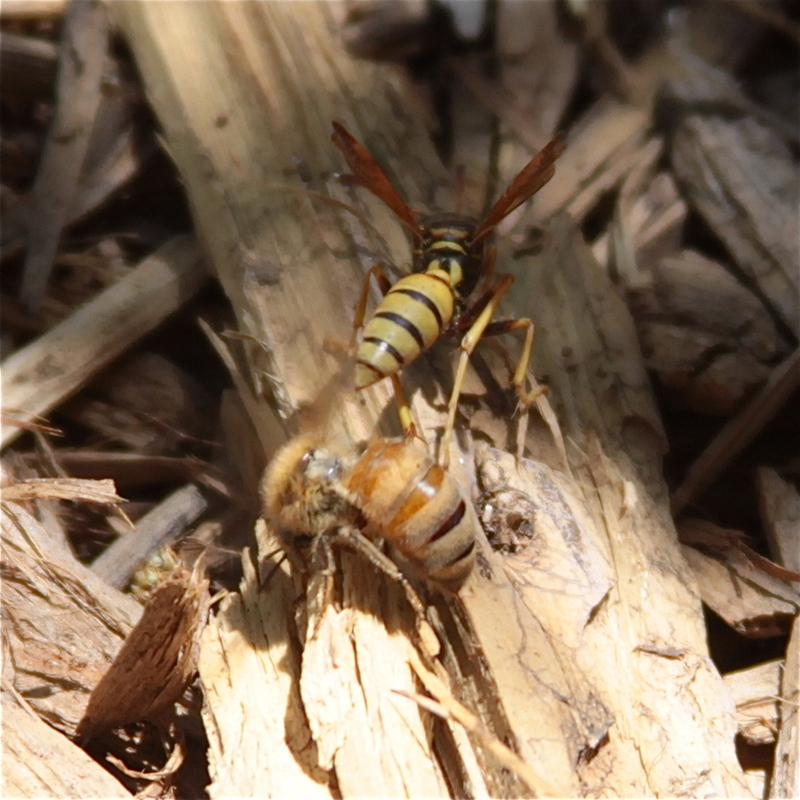 I’ve seen a bee charge a wasp and take it down; it looked like the bee was losing before it finally got away and the wasp crawled off. I have seen how the foragers all come in when roiling gray clouds from the south deepen toward a storm, and how the hive is quiet and full minutes before rain begins and thunder cracks. I’ve watched a bee tapping her abdomen on the floor in the center of the doorway, arching her body, head down, rocking and tapping on the floor. Tap tap tap ~ tap ~ tap tap, turn a partial circle, tap some more, turn another partial circle, tap again, move an inch down the doorway, tap again. What could she be doing, or saying? I’ve watched many other kinds of pollinators busy on the garden’s flowers, and seen more variety than ever now that I’m looking for honeybees. 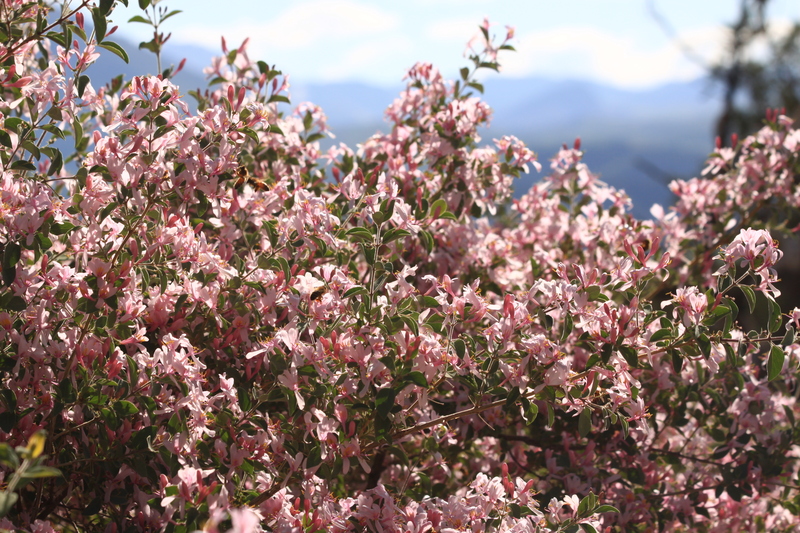 All these years I have spent learning to grow well-adapted flower-rich shrubs, forbs, and trees, pulling noxious weeds, running water, I have unknowingly been creating a stable, rich habitat for bees. All these years I’ve been fostering the restoration of native grasses and wildflowers in the fields and out in the woods, I’ve been making a safer place for bees. This year, though, it could get dicey with the bears. 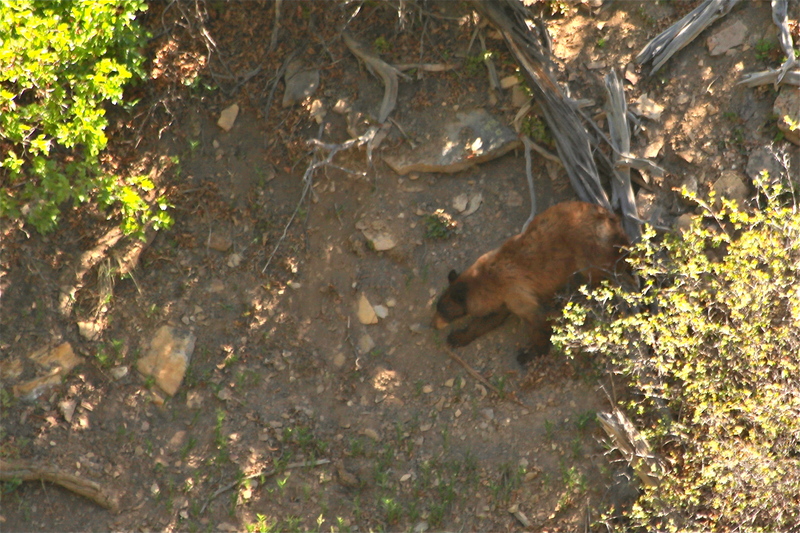 I saw two in the canyon over three days in late May. They’ve emerged early to find very little food available, so they’re desperate and hungry. Fortunately, with a brand new hive, there’s no thick store of honey to attract them, but I’ll have to think about that come fall if food is still scarce for bears, and autumn lingers long and warm again. Each day at least once I peek inside the hive. For the first two weeks, the ball of bees seemed to grow slowly. I knew they were building comb, but until last week I couldn’t see it. Finally one day comb showed at the edge of the ball of bees. The bees have seemed happy and healthy, but seeing the comb brought a new thrill of certainty that this wild swarm is now at home in my yard. My job has been named. I am not a keeper of bees, but a keeper of bee habitat. I am a bee guardian. The idea of bee guardianship is intuitively wildly appealing. It resonates with my world view and my spiritual assumptions. Bees make me watch where I exhale, bees need me to be calm. As I follow my new companions from shrub to tree, extravagant flower to simple bloom, I see my garden, my work, my life, more deeply. I am inspired by bees: bees have given fresh breath to my living. What incredible photography!!!! What camera are you using? Especially for your photos of your bees? The closeups are incredible, would love to know please. Thank you! Thank you! I use a Canon 50D with a 100mm macro lens.